Saloon owner Boyd Grayson is intrigued by his new neighbor, Claire Ashier, and considers her temperance crusade to shut down his noisy tavern nothing more than a game. While matching wits with the beautiful, aloof widow, he uncovers her torturous secrets that shock him to the core. Her pain affects him deeply. He wants to free Claire from her self-imposed prison, but she guards her heart with a gun and memories she can’t forget. As the battle intensifies, so do their feelings for each other. Their unexpected friendship changes the game—and also Boyd. Can he disarm Claire with his love and show her he is a man worthy of her trust…and her love? The story was great-but the best part is the narration! Julie does a wonderful job bringing the story to life! 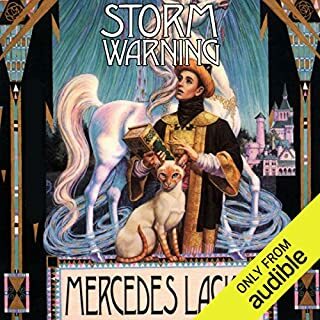 With her phenomenal Mage Winds trilogy, bestselling author Mercedes Lackey captivated fans across the country. Now in the first volume of the series sequel, she continues the same storyline, returning readers to a war-torn Valdemar in preparation to confront an ancient Eastern Empire - ruled by a monarch whose magical tactics by be beyond any sorcery known to the western kingdoms. I think the narrator did a really good job-but I thought his voice was too low on most of his characters. I REALLY didn't like how he portrayed the women in this book. However, I enjoyed being able to work and hear one of my favorite author's books at the same time!! Thanks, Audible!